60 Shades Of Black, will the passion last? There are only two other pursuits that a motorcyclist enjoys almost as much as riding motorcycles, and that is modifying them and talking about them. 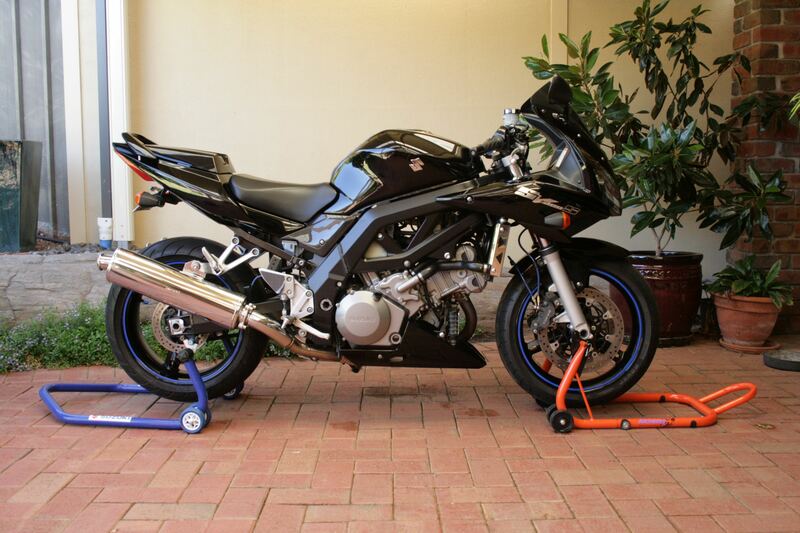 So I hope to now combine the latter two pursuits with an update on my 2006 Suzuki SV1000S. Having owned a number of heavy air-cooled Japanese four-cylinder motorcycles (Kawasaki Z1A, Honda 750 F1, Honda 900 Bol d’Or, Honda CB1100RC), it was a conscious decision to go for something more compact and light that handled well. It was also important that it was easy to ride in my renewed acquaintance with large capacity motorcycles. Price was also a factor, so after scanning the bike adds the SV looked like it fulfilled all the criteria. The clincher though was I had never owned a big V-twin before. In the two and a half years and 10,000km I’ve owned the Suzuki I haven’t been disappointed. The previous owner had embellished the SV with some tasteful modifications and also retained all the original parts, which also came with the Suzuki. I’ve also added on to this, and I’m pretty pleased with the results. Machined billet clutch and brake reservoir with SV logo. The previous owner had cleaned up the rear of the bike with a tail tidy, which gives the rear end a much neater look. 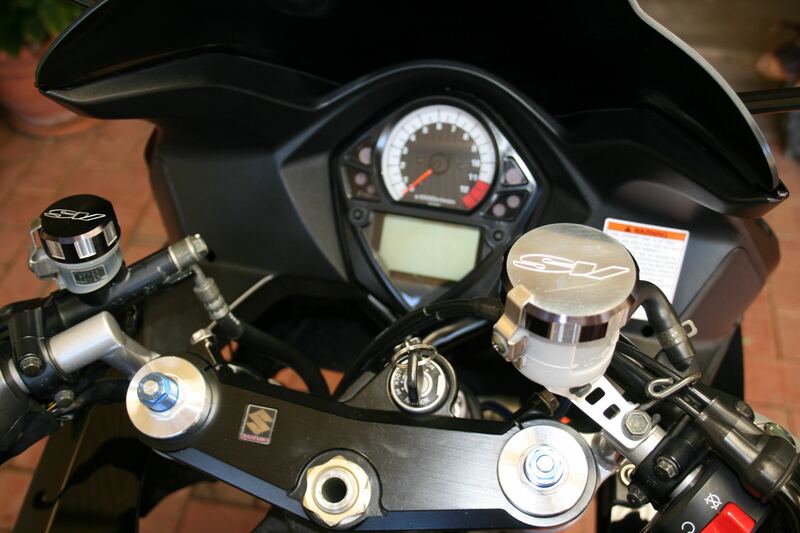 He also fitted a chrome radiator guard, and oil-cooler guard with an SV logo cut into each. A Puig carbon fibre looks double bubble windscreen replaced the clear original, which not only looks good but also gives quite effective protection for the rider. 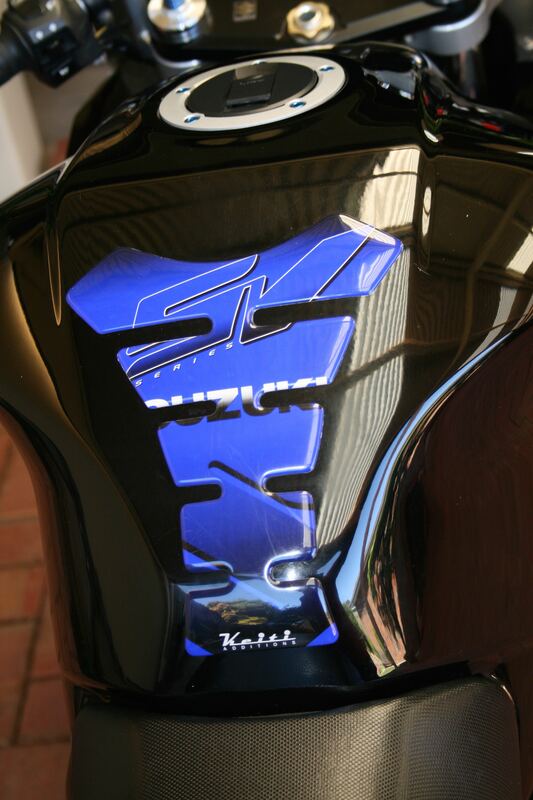 The black paint of the SV has a small blue metal flake in it, and a blue Keiti SV Series tank pad enhances this, which is something I’ve carried over to other mods on the bike. I changed the petrol cap bolts to blue anodised replacements from Pro-bolt, and I also replaced the clutch and front brake reservoir with machined billet ones with an SV logo. These were procured from eBay. 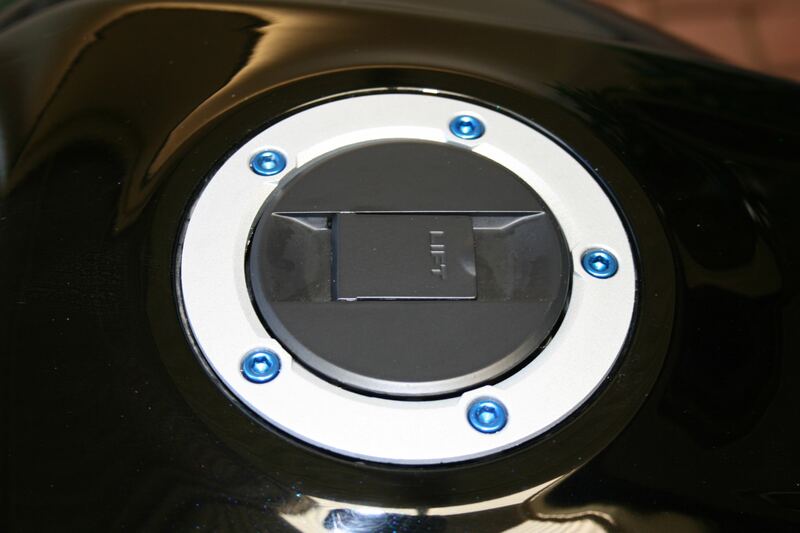 Reflective blue rim tape was attached to the wheels and is available at most motorcycle shops. The air caps on the wheels were replaced with blue anodised units from Cheap as Chips ($4 for a pack of four). To carry the carbon fibre look a bit further a pair of Bestem side covers were purchased from the States and fitted. Another small touch was the fitment of a pair of chrome Suzuki “S” logo rear number plate bolts also bought on eBay. The original SV clip-on handlebars put a lot of pressure on the rider’s wrists, lower back and neck, so I replaced these with a pair of American HeliBars which make the riding position much more comfortable. Doing minor maintenance on the motorcycle was made easier with the purchase of a Suzuki rear paddock stand which came with blue anodised spindles for the swing-arm (Kessner Suzuki) and an Alchemy front stand (Third Gear). The previous owner had also fitted Hel blue braided steel brake lines, which not only look good but also increase initial brake bite and also “feel”. 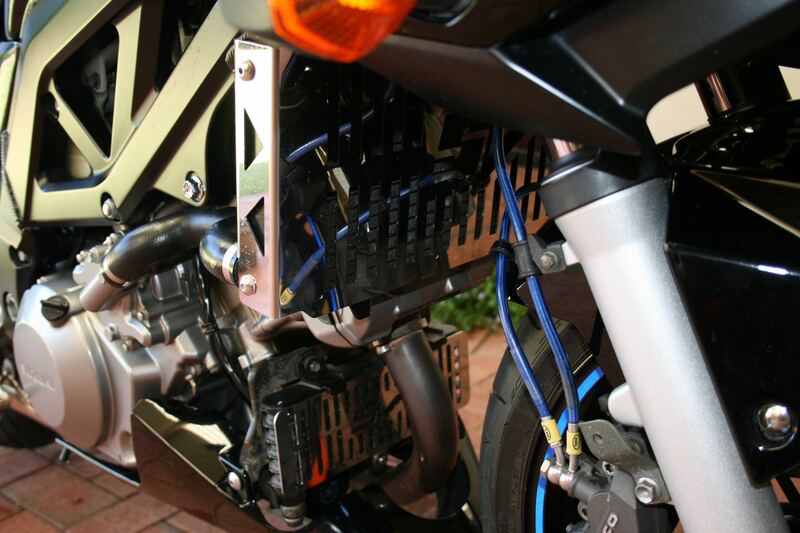 Australian made Staintune polished stainless steel slip-on mufflers had been fitted, and apart from being lighter than stock, they bring some horsepower gains and fantastic exhaust note. I replaced the standard paper air filter with a K&N hi-flow unit, which should also help the engine breath better giving some small power/torque gains. A timing retard eliminator was bought from R rated parts which stop the bikes ECU from retarding the ignition in the first four gears until 4500rpm is reached. Suzuki (and other Japanese manufacturers) use this as a safety feature in case too much throttle is applied in the lower gears. The T.R.E. has made acceleration crisper and the engine smoother at lower revs. I can now comfortably use the lower revs in, the lower gears instead trying to keep the engine feeling more responsive by staying above 4,500rpm. Blue Hel braided steel brake lines. The suspension settings on the SV were too soft at the front and also firm on the rear when I took ownership. I returned the fully adjustable front and rear suspension to the manufacturer’s settings, which I found for my weight, was spot on. The bike feels planted on the road and tracks beautifully through fast sweeping bends and handles the tight stuff pretty well. My only reservation is the oversized 190/50/17 rear tyre, which was fitted to the bike. It does look great, exposed in all its glory by the tail tidy, but a standard size 180/55/17 should enhance the low-speed handling in the tight stuff. The consensus is the standard SV1000S puts out about 105-106 rear wheel horsepower. Taking into account the slip on Staintune mufflers and the hi-flow air filter, I guestimate the SV is making 107 to 108bhp. I hope to have the bike put on the dyno later this year and have a power commander fitted to take any minor wrinkles out of the powerband. I’m hoping to see around 110bhp, which for the type of riding I do, should be more than adequate. There is still the removal of the airbox snorkel to experiment with which could also help engine breathing. Keiti SV Series tank pad. Some earlier models in the SV’s lifespan (2003 to 2007) suffered from a green electric connector failure, which did cause, naturally enough, electrical problems. All models do suffer from a clutch noise affectionately known as “chudder” which pervades itself while riding with low revs at low speed and is also noticeable with the SV in neutral at traffic lights. Its severity varies from bike to bike and to be honest I hardly notice it as I ride mostly on country roads. There is a fix, which involves a modified clutch basket and spring retainers but at the moment it really is not an issue. The SV1000S is suited to sports touring with its effective half fairing but is limited to a degree by its fuel capacity of 17lt. This translates to around 225km-230km before the fuel light comes on, so forward planning is needed to ensure the availability of service stations on long interstate rides. Although its predecessors, the notorious TL1000s and the more desirable TL1000R have overshadowed the SV1000, during its time, it was probably a superior package to the Ducati’s of the day and more reliable. It was also more than a match for the Honda Firestorm. I have been told by a Suzuki technician that valve adjustment is rarely called for at major service interval’s (every 24,0000km) and I was informed by a fellow owner whose SV had covered 75,00km that he was yet to need a valve adjustment. This was backed up by the first major service performed on my own SV at 24,000km. Pretty remarkable for a V-twin that pulls an 11,000rpm redline. And although I will not rule out buying another motorcycle, I know for sure I will not part with my SV1000S. Words Geoff Dawes © 2015. Images Geoff Dawes © 2015. This entry was posted in Motorcycling and tagged carbon Fibre, Hel braided steel brake lines, Puig, Staintune Mufflers, Suzuki SV1000S, T.R.E. on 30/06/2015 by Geoff Dawes.